Here’s a fun new one for Target - a little Birthday Cake GiftCard! Available in stores and online now. Creative Direction: Mariah Groh and Brian Holt. Our new 'Gingerbread Train' GiftCard is now available in store and online at Target. It evens smells like peppermint! Thanks to our A.D. Brian Holt once again! We're extremely excited to announce that the 7th Annual Heartwork Art Benefit is now live! Massive thanks to this years amazing contributing artists: Loris Lora, JP Coovert, John Hendrix, Truck Torrence, Andy J. Miller, Ben Butcher, DKNG, Dana Tanamachi, Erica Williams and Leo Espinosa. Special thanks to Matt Kaufenberg for creating this year's mini-print that comes free with the first 100 orders. And always, thanks to our partner in crime, Ted Halbur at Target, for dreaming this up over 7 years ago! 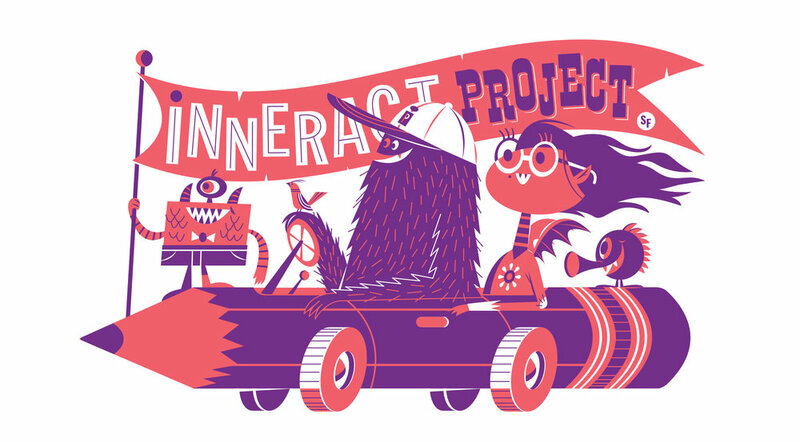 Had a blast making a little thing for the great folks at Inneract Project in San Francisco. Inneract Project empowers youth through design education that links them to opportunities to explore design in college, career, and life. Vroom!